The Femmes’ Video Art Festival was started by Micol Hebron for The Situation Room in 2015. The festival is curated from an open call for female-identified video artists to submit works made in the last 3 years. The objective of the festival is to explore and celebrate the issues, themes, and artistic styles that are being addressed by female-identified artists today. The themes of the curatorial selections emerge from the submissions. From more than 300 submissions, 120 videos were selected to be a part of the Festival, and to be featured in thematic programs at LACE. We are delighted to feature work by artists from all over the globe, artists who are early in their careers, and artists who are established. Hebron has been curating programming to coincide with the Gallery Tally exhibition. The programs are intended to explore different facets and forms of feminism, including: a conversation with teenage male feminists; a panel on transfeminism and TERFS, Feminist Friday social event; and a panel on gender and the market. The Femmes’ Video Art Festival is an annual festival that takes place at The Situation Room, but this year we’re also showing it at LACE, with extended programming for the occasion. As with the Femmes’ festival, the Gallery Tally exhibition and the other events, Hebron aims to provide platforms and opportunities for female-identified artists and community members to have a voice, to share their work, and to engage in conversation and collaboration. The Situation Room is a community project space located in Eagle Rock, CA. It was founded in 2015 by Micol Hebron, with the objective of providing space and resources for artistic and artist projects that may not have time or space in more traditional artistic venues. Operating with feminist ideology of collaboration, horizontality, alternative economies, and consciousness-raising, all members of the community are always welcome to propose and/or attend projects at The Situation Room. 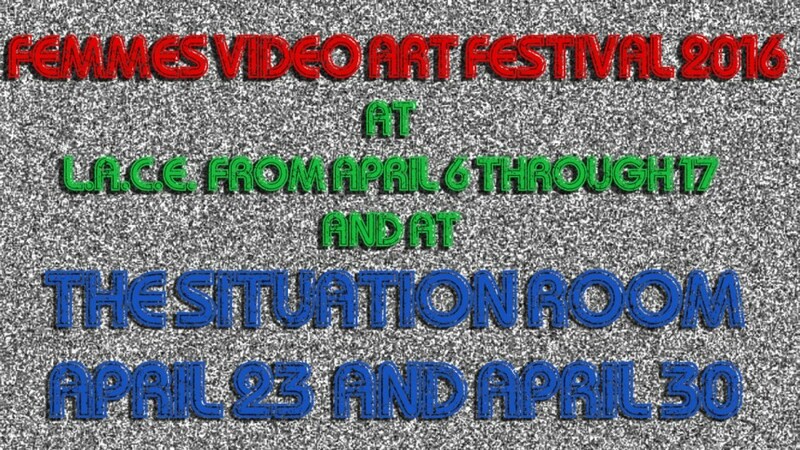 The Femmes’ Video Art Festival screenings will occur at The Situation Room (2313 Norwalk Ave, Los Angeles, CA 90041) on April 23rd and April 30th, with unique programming each night, from 8-11pm. This program features videos that explore empirical truths, and constructed realities, with videos that are documentary, and videos in which the artist explores fictional narratives, perhaps alluding to realities that they wish were truths, or critiquing those that are. They range in content from sexuality, identity, ecology, and pop culture. Feminism branches into all facets of life and society – from reproductive rights, language, politics, economics, ecology, rites and rituals, ‘mother earth’, relationships, employment, and so many more. There is an important history of femmes addressing ecology, the earth, the elements, the environment. This series features works that address feminine perspectives and interactions wtih the land, water, landscape, and nature. This thematic includes videos that address the female perspective on fashion, and the dangers and constrictions that women, specifically, experience from clothing – an instrument of external oppression. There are also videos about the female subject inside domestic architecture. These recall the pre-raphaelite paintings of women inside houses looking longingly through the windows at the natural world outside. Videos in this section explore the relationship of the female mind and body to architectural space, and the ways in which that space can shape our thoughts and actions. The videos in this program explore structural and post-structural use of language, the pairing of language and image, language as image, and image as language; as well as split screen videos that address subjectivity through notions of the fragmented and multifaceted self. This program offers examples of the many ways that women use their bodies as vehicles for exploring and reflecting the role of the female subject in society, nature, and history. “Performance” is defined in various ways, including dance, ritual, theater, performance art, intervention, and roleplay. Masks, costumes, and characters assist in presenting the body as a political and philosophical site. The videos in the main festival screenings for FVAF2 consist of a range of stylistic approaches by artists from around the world. The festival is intended to provide an overview of the perspectives and characteristics in video art made by women today. There are videos by emerging and established artists alike; videos that are documentary, fictional, performative, animated. The sequence of videos is curated to build commentary and narrative – look for relationships between successive videos as you watch!